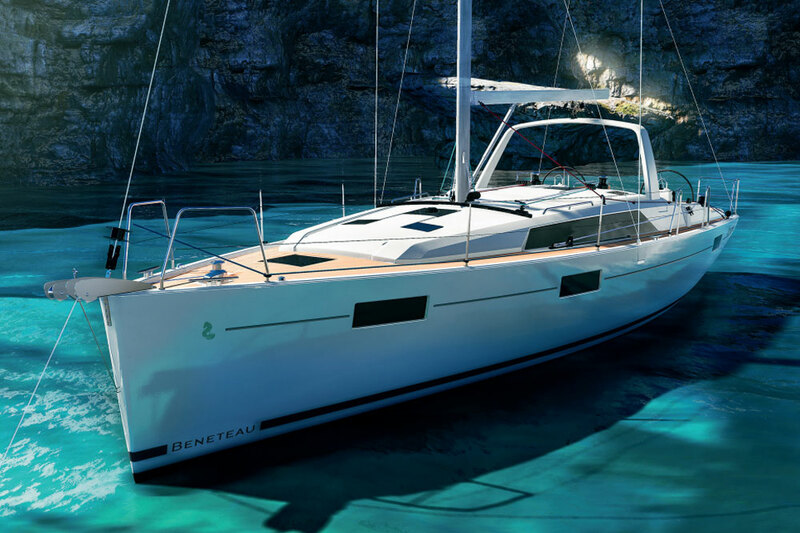 The fourth in the Beneteau Sense line, the 46 includes sailing catamaran crossover benefits for those who love cats but are not quite ready to commit. 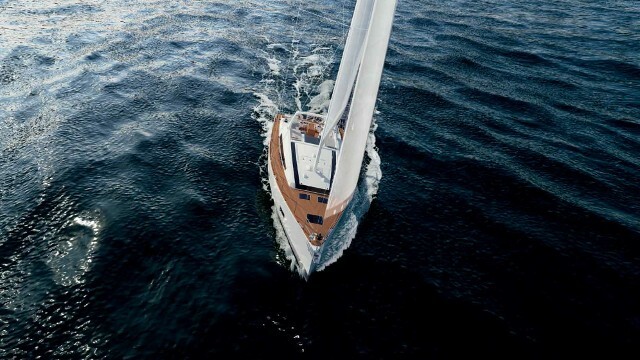 The Sense 46 has sailing catamaran appeal, in a monohull package. The Sense 46 has Beneteau’s Dock-and-Go steering system with a joystick that synchronizes a Saildrive and a bowthruster to move the boat forward, aft, or completely sideways. This system takes the anxiety out of docking and versions of it are starting to appear on other brands of sailboats as well. The large Yanmar 75 hp diesel has plenty of power when needed. In fact, it is the same size engine as on the Sense 50, which has 7,000 pounds more displacement. Like her other Sense siblings, the 46 has a generous beam (14’ 6”) and a hard chine that helps her sail flat, or more upright. 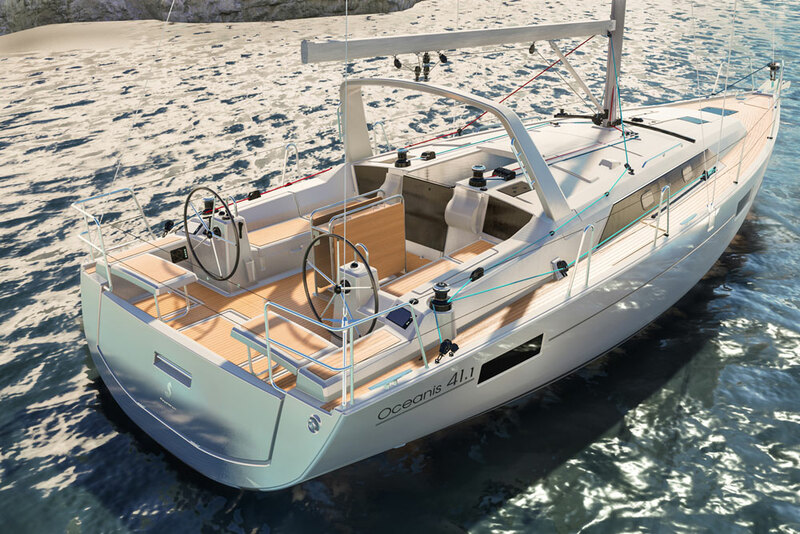 She also has the expansive cockpit that has redefined how sailors enjoy their outdoor space, much as we saw in the largest model of the line, the Sense 55. It’s these features that give the Sense a multihull feel but with benefits of still fitting into a standard sized slip. Life aboard the Sense 46 includes three somewhat separate areas that still flow seamlessly together. The first is the easy outdoor living of the cockpit where the helm seats lift sideways to open up the entire transom for easy boarding. Twin wheels provide good visibility forward and winches are within reach for stress-free singlehanded sailing. The mainsheet is up and out of the way on an arch that also serves as a great attachment point for a dodger. A U-shaped settee on starboard surrounds a table that can be folded and lowered to a cocktail table or made into a sun pad for two. To port is a straight bench seat below which is a cavernous lazarette that can double as an optional bunk for either adventurous kids or guests you don’t particularly like. As on other Sense models, the space below the cockpit sole is reserved for noisy machinery (like pumps and an optional genset) and the sole lifts up to reveal excellent access to the systems below. 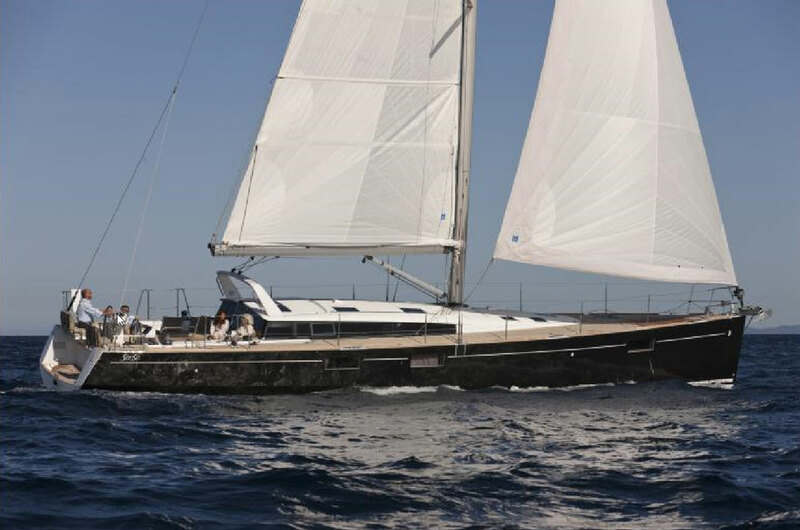 The Sense 46 has a broad beam and rides on a hard chine that helps keep the boat sailing on an even keel. The second living area is the combined salon and galley. Three easy steps down lead to the communal part of the interior. To starboard is a U-shaped settee that also forms the seat of the aft-facing navigation station. To port is straight-line galley with twin sinks, a top-loading refrigerator and a three-burner stove and oven combo. The galley and salon are the same length so the whole area forms a social square, perfect for dinners and gatherings where everyone can be seen and heard. This social space is bisected by a small center island that holds an optional pop-up flatscreen TV facing the salon. If you’re the cook you’re out of luck, since you can’t watch it while you prepare dinner. Generous expanses of white headliner and bulkheads are accented with Alpi wood trim and the effect is very clean and organized. Each side of the boat has a large fixed port, an overhead hatch and another port that faces the cockpit. Light abounds and there’s absolutely no feeling of being “below,” which is another way the Sense appeals to catamaran enthusiasts. Moving forward, we come to the third and private living area. Two cabins and two heads accommodate four and provide lots of stowage. The master stateroom is forward with an island bed and vanity desk. The en suite head can only be accessed from this cabin and has a large stall shower. Since machinery is located aft in the Sense 46, cabin areas like the forward stateroom enjoy an unusual level of peace and quiet. The guest cabin is to port and has a double berth with the head at the aft end. An en suite bath compartment includes a stall shower and a sink. The head and another small sink are outside the cabin, across the hall in a separate compartment. In a way this makes great sense, pardon the pun. It creates a day head that can be accessed by visitors without disturbing the occupants of the guest cabin, who can take a shower and get dressed in the privacy of their own stateroom. Good thinking, Beneteau. Sail Area 1,072 sq. 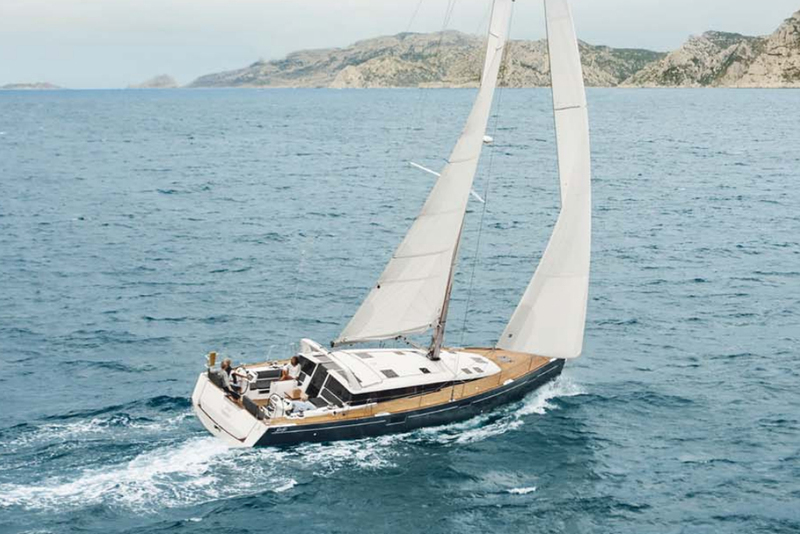 ft.
I’ve asked dealers about the differences in positioning of Beneteau’s Sense line versus the Oceanis, which was impressive enough in its own right to make our list of 10 Great Innovations in Modern Sailing. Both boats are low and sleek with the Sense having a particularly attractive profile. Both boats have good stowage, a manageable sail plan, a responsive hull shape and decent tankage for extended cruising. So who is buying a Sense versus an Oceanis? I’ve gotten a colorful variety of answers, the most consistent of which positions the Sense as the boat for comfortable onboard living at anchor or the dock, and leisurely coastal cruising. The Oceanis seems less catamaran-like, reaching more for long-distance cruising with a nod to performance. 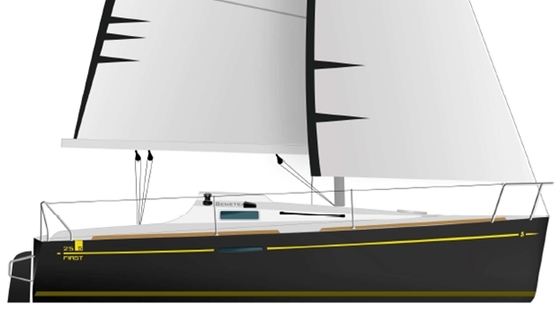 It would be interesting to put the Sense 46 up against the Oceanis 48 to see where the strengths lie. I, for one, am up for that grueling test. 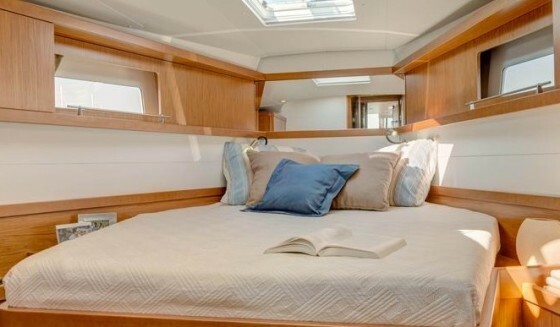 Other choices: The Jeanneau Sun Odyssey 44 Deck Salon also exhibits a great use of space, as does the Bavaria Cruiser 45. 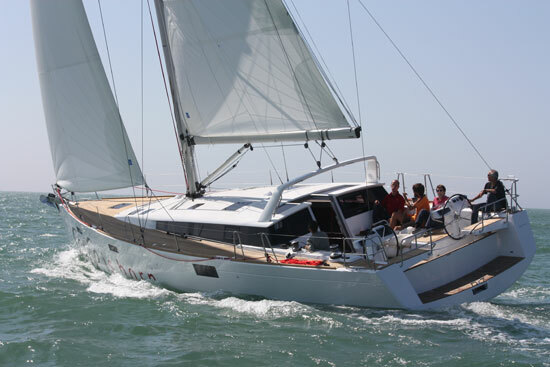 If you want to go the catamaran route, see the Helia 44. To get a better look at the Sense 46 both inside and out, watch Zuzana’s Beneteau Sense 46 Short Take Video, or visit Beneteau.